DIY Storage/Luggage Compartment under the bus?? Ideally we want to find a bus with a good amount of under bus compartments but in the case we don't, is there anyone out there that made their own? What did it take to build your own storage compartment? Would it be better to just buy the compartment and install them? We will be using these for batteries, future solar component storage and a few other things that don't need to be inside the bus. The storage compartments installed at the factory are junk. Poorly mounted, never seal, can't take much weight, big gaps for rust to hide, ect. A ton of time and money is whats needed to build good basement storage. I will have about $5,000 to $6,000 in building my basement storage alone. It like the rest of the bus will be galvanized metal. I will use 14 ga for my boxes. I plan on doing a few more, I also intend to cut the bottom of the box open so I can make the storage area extend all the way (27in) to the frame. That doesn't describe my storage boxes on the Ward at all. They are very nice. In your opinion they are vary nice. Please post detailed pics. IMO they are probably still junk as I have a higher standard of expectation than most. I have seen hundreds upon hundreds of buses working at the the bus yard across the road from where I live. None of the boxes impressed me, except the polly tank boxes on the new reduced metal buses. No they are very nice. The quality may vary from manufacturer to manufacturer though. I haven't decided which way to go. I am not good enough to build my own or I would go fiberglass. I have looked at the truck bed boxes that open on the side. It would likely mean cutting and adding on to make use of the whole area between the frame and sides. There is the site I found the image on. They look like they have anything. 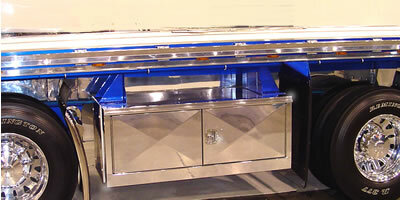 Truck Tool boxes for Light Truck to Semi Truck Tarp & Tie-down Storage. Take it from a guy who is learning the hard way, get a bus with no under storage and add your own. They are usually cheaper if they don't have the storage, and even though the compartments on my bus (International) are in great shape and don't leak, they just aren't big enough for the types of things you need in an RV. They are meant to hold sporting equipment for road games, not generators, lawn tables, water tanks and associated plumbing, etc. I searched long and paid more for a bus with storage all the way down both sides, and now I'm looking at ripping all of it out and replacing it with my own custom built. If you don't want to build them, just get storage boxes from the underside of flatbed trucks or transfer trailers, and bolt them right in. Gods, my mistakes are costing me time and money, neither of which I have in large supply. If you are a good wielder and have the metal, build your own to suit. Remember, at least with front engine buses, they compartments only go 18"~24" deep, not all the way through like a standard RV. Th "compartments" on my bus are only the two bays that held the batteries. Neither one goes all the way to the floor bottom nor all the way to the closest beam that runs the length of the bus. That is a lot of lost space. But they do have a purpose. One holds the house bank. The other holds the inverters, cabling, etc involved with the electrical. I have discovered... Super Strut! Building an open frame under the bus and enclosing or grating as needed. I long-term and almost everything I have is set up to ride/live inside the bus or travel on the Jeep. Or in the case of the gas grill, too yukky to travel inside. In NM, stuff left setting outside gets relocated by the wind to the neighbour's. Thanks everyone! All that info gave me lots of ideas to work with!